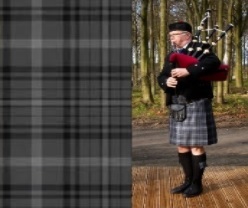 This Piper has played at many weddings and celebrations, and has a wide repertoire of tunes. He is always willing to take on any new tune, and luckily for him, he can 'play by ear', so no tune is out of the question. He has been playing the pipes for over twenty five years in various bands, as a solo artist, and also as a session musician. He takes pride in his music, and will go out of his way to make your special day even more magical and atmospheric. Whether it be playing as guests arrive/emerge or playing smallpipes during the signing of the register. Costumes / Dress: He normally wears a daywear highland uniform, consisting of a black waistcoat, argyll jacket black socks and glengarry with either the Grey Bute or mainly green Hunting Sutherland tartan kilt. Experience: His music has taken him all over the world, to places such as Israel, Australia, Italy, France, Germany, Belgium and Holland, to name a few. He has won several trophies and awards over the years, and played at some big venues around Europe. In the North of England, he has performed at the Sage Gateshead, St James's Park, Alnwick Castle, Hexham Queen's Hall, Sunderland Empire Theatre and Whitley Bay Playhouse.